Teriyaki Turkey Drum – Stahl-Meyer Foods, Inc. In a small saucepan, combine 1/2 cup water, soy sauce, honey, sherry, scallions, ginger, star anise and garlic. Simmer over low heat for 10 minutes. Whisk in the oil. Reserve 1/4 cup of the marinade. Line a large baking sheet with aluminum foil. Pat the drumsticks dry; season with salt and pepper and place on prepared pan. Brush turkey all over with half the remaining marinade (leave as much of the solids in the saucepan as possible). Scatter star anise over drumsticks (some will fall on baking pan, and that’s fine). Marinate at room temperature for 30 minutes. Heat the oven to 400 degrees. 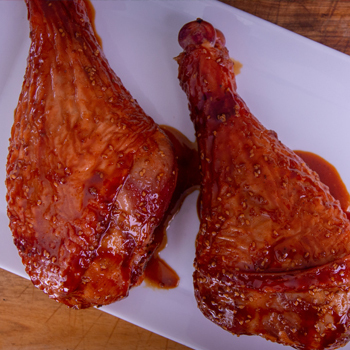 Roast drumsticks, turning and basting with more of the marinade occasionally, until an instant-read thermometer inserted in the thickest part of the meat registers 165 degrees, 1 to 1 1/2 hours. Drizzle with reserved marinade before serving.